This popular summer festival takes place each year, Monday through Sunday, in the third full week of August, in the ideal location on Washington’s breezy southwestern-most coast – Long Beach, Washington. Fighter kites, kite ballet, fireworks, exhibitions and the magical lighted night flies are among the festival’s many highlights. Four mass ascensions promise a spectacular exhibit of 250 kites in the air at one time. 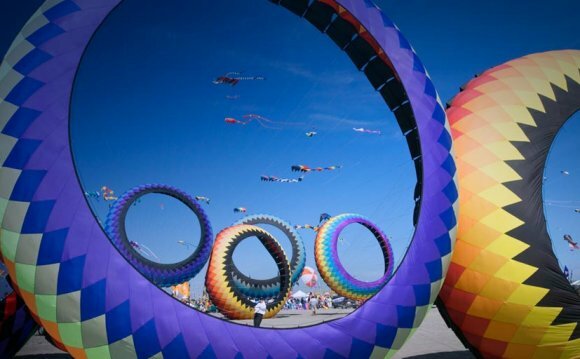 While spectators find ample visual attractions, kite enthusiasts of all ages are invited to participate in kite building, flying competitions and hands-on activities throughout the festival. Each year featured flyers selected from throughout the world add a unique blend of art and ingenuity to the week’s colorful skies. This premier Kite Festival takes place a couple of blocks from downtown Long Beach on the expansive beach on the Pacific Ocean coastline, along the Bolstad beach approach and adjacent to a ½-mile long boardwalk – an excellent viewing platform during the event. Food booths, merchandise and kite vendors line the approach adding to the festive atmosphere. The Kite Festival is free to the public; entry fees are required for competitions. Lodging during the festival can fill up quickly so it is best to make advance reservations. The festival, which began as a humble gathering of nine participants and one kite team, has grown into one of the largest kite festivals in North America, enticing thousands of visitors from around the world who share a passion for kite flying. The first kite festival in 1981 still holds the Guinness record for keeping a kite in the air for the longest time – 180 hours. The team from Edmunds Community College set that record. In 1983, the festival began attracting an international audience with flyers from Japan and now sees flyers from Australia, Italy, England, Indonesia, New Zealand, India, France, Germany, The Netherlands, Brazil, China, and other far-reaching places. With wide sandy beaches and coastal breezes, Long Beach has been called the Kite Capital of the U.S. Kite shops, resident kite flyers and the beloved World Kite Museum & Hall of Fame (a must-see attraction for everyone!) provide enjoyment for kite enthusiasts and first-time flyers alike. In addition to the town of Long Beach, the Long Beach Peninsula boasts a string of coastal communities with award-winning restaurants, seafood markets, unique accommodations, shops, and galleries. Attractions include national and state parks, the Lewis and Clark Interpretive Center, two historic lighthouses, an eight-mile coastal bike and pedestrian trail, the Willapa Bay National Wildlife Refuge, one-of-a-kind museums and a 20-mile stretch of public beach. For detailed Kite Festival events, featured flyer biographies, and a full schedule of activities, please access . As proud as we are about the pains we have taken to make sure our lists of top events in the USA are as accurate as possible - there is no doubt that we have missed some very important events and we are always keen to hear responses and suggestions about possible additions to the site . . . If you have any suggestions please let us know. Please take the time to share your views on the selections of the top events in the USA as presented here at Top Events USA. Kite Festival in Long Beach, WA.